No one could accuse the founders of Ascent Solutions of not thinking big from day one. The firm, which specialises in an electronic tracking security system for the Customs and revenue authorities and for owners of valuable freight and hazardous material, always saw itself as an international operator. Chief executive Lim Chee Kean, also known as CK Lim, tells The Straits Times he knew Singapore was too small a market for a service that was meant to travel the world. "We were global from day one of forming this company. We knew this (service) would not enjoy a high take-up rate if we tried to sell it in Singapore alone." Its integrated security portal - called iSpot, whose patent is pending - helps clients track cargo in East Africa, Indonesia, Thailand, China and Singapore. "A lot of our customers are (also Customs authorities around the world). The more dangerous the country is, the more popular we are because there is a need for security tracking," says Mr Lim. "We tell you when something goes wrong, who exactly is in custody of that particular cargo." For example, if a container falls from a height and products are destroyed, Ascent's platform pinpoints where and when the incident happened, and who was responsible as its service creates an audit trail that records everything from start to finish. "This will definitely help expedite the processing of insurance claims," he says. The firm, set up in 2010, won its first contract in early 2011 with Indonesian Customs. Contracts from China and Africa soon followed. 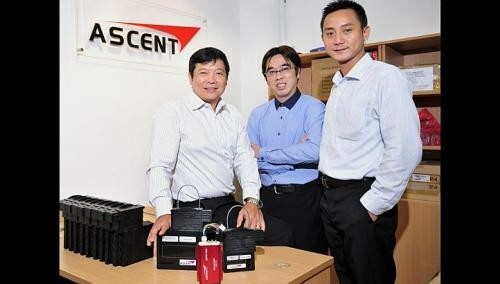 Ascent logged more than $10 million in sales in its first two years, which was "quite incredible", notes Mr Lim. "By the time we won the second and third Customs contract, we knew we were off to a very different kind of market." This comes from someone who was initially looking to secure business only from South-east Asia due to the demand for such tracking needs in the area. "The region itself is interesting, like the great Mekong region, with Laos and Cambodia... We were thinking of the low hanging fruit," says Mr Lim. An inquiry in 2010 led Ascent to establish itself in the East African market, which was a real blessing. The East African nations including Kenya, Tanzania, Uganda, Rwanda and Burundi are working in a single Customs territory. Firms moving freight within the single Customs territory have to work towards using the same electronic cargo tracking system from next January. Ascent's iSpot has already been approved as the electronic cargo tracking system for the Kenyan and Tanzanian Customs authorities, which is a huge boost to the business, adds Mr Lim, who sees great potential in Africa. The growing popularity of the Trans-Siberian route will create more demand for comprehensive cargo tracking, adds Mr Lim. He and his co-founders were so confident of the service they could offer, they started the company before its first prototype was created. "What we did quite differently from a lot of start-ups was that we didn't start on the conservative mode. A lot of companies build the product, then wait for the market to take it up. "We didn't even have the product; we went out there to sell ahead so that we could come back and build a product that would be needed by the international market." Despite that boldness, setting up the firm still required a huge leap of faith. "Knowing we could stay in our comfortable (multinational company) jobs, coming out to form a start-up is always not easy." Mr Lim, who has a background in computer science and IT logistics, left his job as president of tech firm Savi Technology Asia and put as much as $1 million into the business. He roped in Mr Chew Kia Boon as Ascent's technology director, and Mr Gregory Lee, its solutions and strategy director. The firm has 18 employees. Mr Lim says to go beyond Singapore requires a firm to "embrace and understand the culture of doing business in different countries. Be nimble and flexible enough to structure deals that work for each country". He notes that small companies tend to forget about a country's rules and legal conditions but these are essential if a business is thinking of breaking into new frontiers. "You want be successful in a particular region, you really have to be there (in person) to understand how to do business in different parts of the world. "The Singapore market is just too small and the world is so connected today. You cannot be conservative and always test the market in where you're from." Mr Lim urges bosses to take advantage of today's borderless world: "Going global from day one has to be the new motto for firms."